Brad has sculpted his entire life. Many of his works were given away as a child. Brad and his family rarely took photographs, mainly because they owned no camera. His earliest stone sculpture, 'John the Baptist', began in 1970. It measured 18"w x 36"h and was created when the artist was thirteen years old. Around the same time Brad made numerous award winning ceramic sculptures of people that were fired and sold at art fairs. The largest piece Brad has ever created in clay measured 24" from shoulder to shoulder and 28" high. It was of a bust of Leonardo Di Vinci that he began during his sophomore year in high school. From his exquisite lamplighter sculptures to his hand made brass clock, Brad has always had a love for creating beautiful sculptures through very unique methods and materials. His painting 'The Creation of Adam,' was initially meant to be carved out of marble and set into matching slabs of marble. It would be viewed at ground level in a gallery. However, Brad did not have the money, at the age of fifteen, to purchase such a piece of stone, nor did he have a place to work on it. The pastel is Brad's interpretation of the marble sculpture he initially envisioned the piece to be. This is a bronze sculpture that was reproduced without artist Bradley J. Parrish's approval. 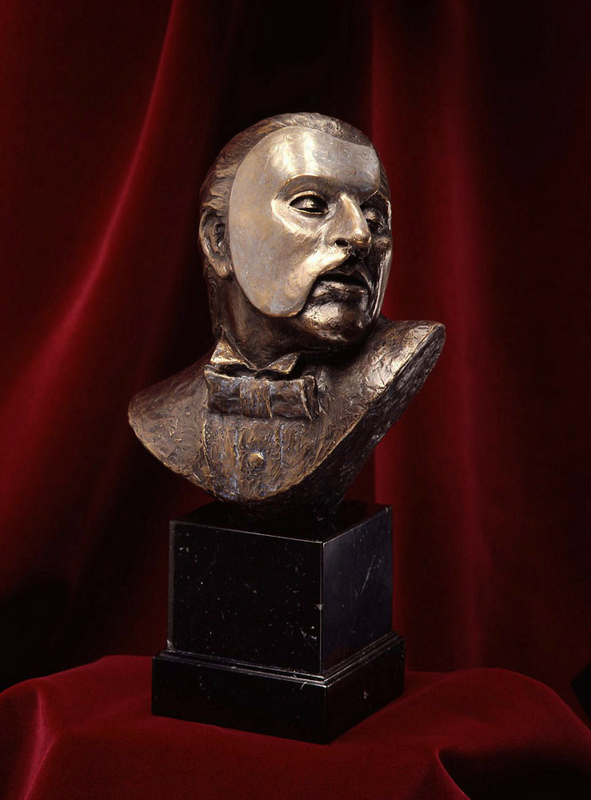 The original bronze casting created from the artist's own wax mold was cast into bronze back in 1992 and was sold to a prominent art collector of Mr. Parrish's artwork back in the late 1990's. This particular bronze piece was cast off of the one and only one bronze that Brad approved back in 1992 and not directly from the wax mold it should have been cast from. Mr. Parrish came across this piece as a galley in New York had made him aware of this bronze being made and being sold without his permission. His publisher had a company make a mold from his first and only bronze without notifying Brad of that they were also making this casting and that these bronze pieces were being released to galleries to sell without his knowledge and his approval. They had even covered up Brad's signature, numbers and date forging his signature and the number of the unauthorized piece. As far as we know, there were as few as 3 of these made per the number in this sculpture or possibly many more. Brad seems to think they may have had only 3 of these made but cant be sure of that for sure as the publisher is now out of business. If you look at the original bronze reproduced under the artist's supervision in the "Sculpture" gallery of this website you will the differences including his "Patina" meaning (Colored Finish) on the piece. The original bronze from his original wax mold has a lot crisper detail and the Patina much more subtle. Everything has been documented and photographed on this piece. Mr. Parrish who still has the original wax mold along with the original mold used to produce other wax molds direct from the clay piece he made will use these molds to produce and sell as the original edition that Brad wants to release in the years to come. Only the one person purchasing this piece #3 of 50 will receive the exact same number from the original edition bronze sculpture that is to be cast free of charge and this one returned to be destroyed. Anyone else that has purchased either #1, #2, #4 and above please contact us so that we may know how many of these were cast and sold without the artist authorization. The Original edition to be produced will clearly be marked differently as far as "Parrish" signature and markings that are shown on this piece signed and numbered will be the entire edition numbering from 1 to 50 pieces made. We will make all attempts in posting the availability of the entire edition on our website and on social media sites. This piece also comes with a certificate of authenticity signed by the artist explaining this bronze sculptures history which has been described herein. This bronze sculpture has been sold. Below are several other photos of this bronze piece. Above: This photo shows a detail under the shoulder of someone in the foundry who has carved the artist number into this piece along with the number of the piece and how many pieces are in the edition. In this case, this is the number 3 piece in the total edition of 50 to be made in the edition. 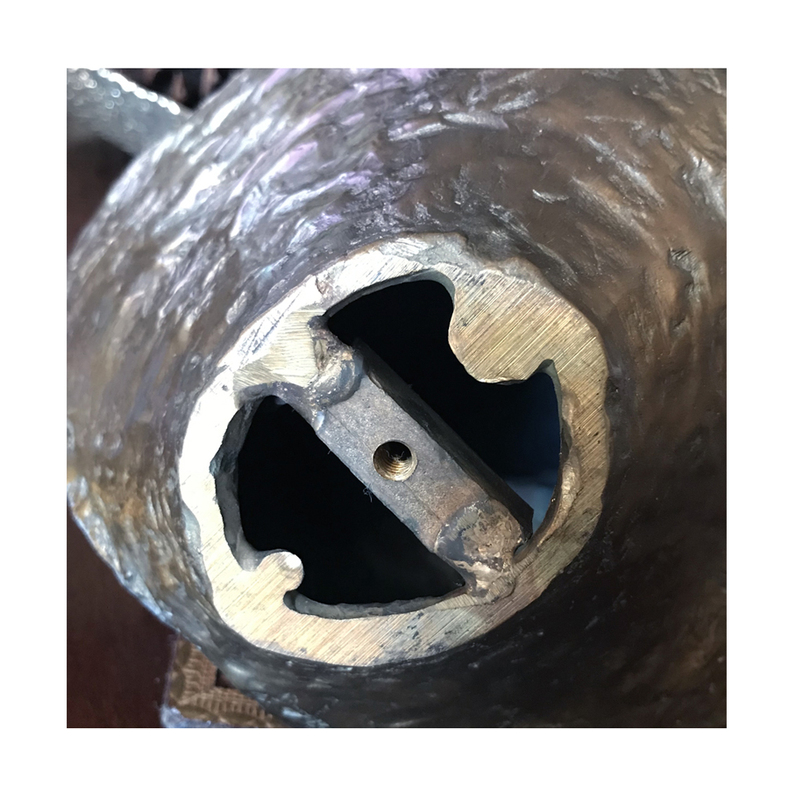 Above: This is the very bottom of the bronze sculpture that shows the support and threaded hole to screw on a base of your liking. Dated: 1987 / Hand Carved Wood/Brass & Velvet Sculpture. Measures 7"W x 9"D x 10"H.
When the lamplighter book if matches is removed from sculpture to light the fire in the fireplace, the lamplighter figure begins to rotate. Both the lamp post and the lantern at his feet illuminate and flicker until the book of matches is placed back into the sculpture. Everything in this piece has been painstakingly designed, engineered, built and hand carved by Artist Bradley J. Parrish including many of the inside brass mechanisms. Materials used: The Lamplighter - "Walnut" was hand carved and painted. The lantern, lamppost and decorative outside accents- "Brass and Plexiglass", all hand cut, tooled polished / painted and soldered. The Snow - "Spackling or Drywall Compound", also "Plaster of Paris". The photograph of Brads rendering is that of the Famous 662 pound gorilla named Sampson. Sampson was world famous and a lifelong resident of the Milwaukee county zoo. He died suddenly of a heart attack in 1981. Brad, who had been a regular to the zoo, would stand for hours observing Sampson run across his glass enclosure banging on the windows and scarring people. Like most everyone, Brad was devastated that his long time friend was gone. After Sampson death the out pouring from the public to do something to memorialize this great ape grew. The director held an open competition to select a sculpture to honor Sampson. Brad's vision to pay tribute to his long time friend is what you see here in his drawings and his scaled down clay model. Brad decided to design a very large and very strong work that would capture the size, the essence and the spirit of this magnificent animal. Something people would never forget. Brad's proposal was submitted to the zoo. The zoo director and a committee rendered their decision having chosen a small bronze head of Sampson on a pedestal to be placed in the new great ape pavilion. Brad was so disappointed, not for himself and the fact they did not go with his proposal, rather it was the fact that they had gone the cheapest and most inconspicuous route in trying to down play an animal receiving so much attention after his death. Brad says he remembers the zoo director mentioning that he was opposed in animals in zoos receiving a superstar status and was concerned that Sampson's death and a memorial to glorify the animal would be doing just that. In Brad's opinion the zoo director and the committee did a very large disservice to the Milwaukee County Zoo, also to the people of Milwaukee County not to mention hundreds of thousands that have traveled from all over the world each year to come to our zoo over over three decades to glance upon this gentle giant. To honor him and to give thanks for the millions of dollars he has brought to our community in the form a a tiny bust of him no bigger than one found on the shelf of any library in America is to minimize Sampson's impact on so many people. Brad was so upset over what the zoo director and his committee did not do in fulfilling the public's wish to have a meaningful memorial to pay homage to this beautiful animal through an equally reflective work of art. that he destroyed his clay model and put his drawings away in storage never to pull them out again. To this day, the artist who has studied and painted so many animals from this zoo and was welcome when ever he wanted to go behind the scenes and chat with the keepers cannot, bring himself to visit this zoo anymore. Brad knows in his heart and through his art that he has paid homage to all of these beautiful animals he has had the pleasure of studying all these decades at the Milwaukee County Zoo. He knows the beauty of the animals he has painted over the years will live on through his paintings and that God's creations whether it be man or beast are beautiful and are sacred in God's great plan. To appreciate and admire these animals is no different from those things we appreciate and admire about our own pets. Brad uses his God given talents that he has been blessed with to acknowledge the beauty of his creator's efforts and not as a means to exploit or make superstars out of animals, as the zoo director has alluded people want to do. This piece started in 2008 never made it to completion due to more pressing works Brad was working on. 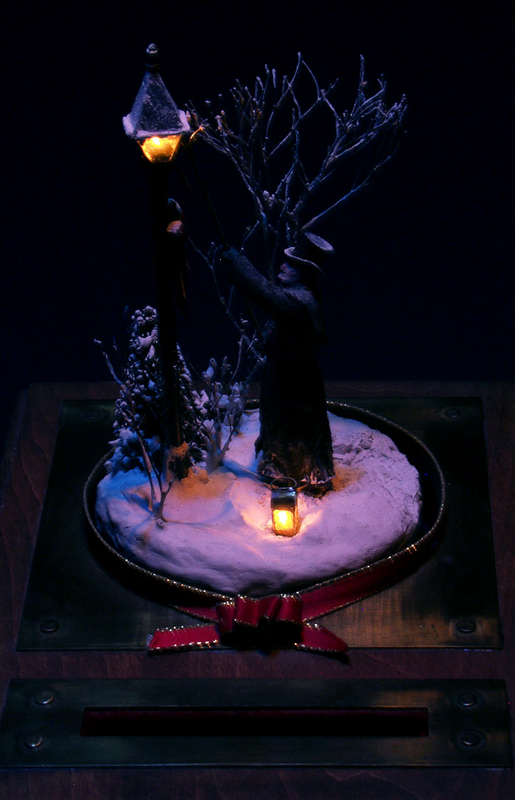 After a couple years of sitting around Brad used the modeling clay from this piece to do a much larger work called the "Lamplighter which he started in 2011. This is the very first marble sculpture that Brad ever put a hammer and chisel too. This piece of marble was a lot of money for a family that could barely make ends meet. His grandfather gave Brad one of his carpentry hammers to use as there was no money for an actual stone chisel. He was also given a 1/2 inch chisel and a center punch to chip away at the stone. What you see here is the bust 'John the Baptist', emerging from the top of the stone. What you don't see in the stone itself is a ornate rectangular carved base that would have held the bust up. This Photograph was taken days before the bust was stolen from Brad's family's back patio. It was carried out to the nearby road and dropped on it's head by vandals. The head and right shoulder were cracked off. Brad never pursued other works in this medium for fear, without a proper work space, his art would be vandalized again.